William Branham taught that discernment (the revealing of people's hearts) was the "Sign of the Messiah". He used the example of Jesus talking to the woman at the well, and then showed how he (William Branham) also possessed this sign as proof that he was a prophet. 1 Did Jesus use prayer cards? 2 Who looks for a sign? 3 What sign did Jesus promise? 4 What Old Testament Prophecy tells of the Messiah revealing the hearts? 5 Did Jesus have the gift of discernment? Did Jesus use prayer cards? When you listen to the tapes of discernment, these are the only questions that William Branham is discerning. 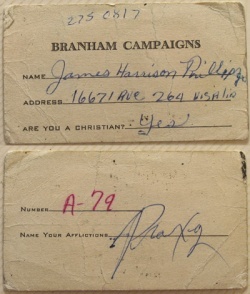 In other words, he is publicly discerning information that these individuals had shared with the Branham Campaigns in private before they came up to the platform. Who looks for a sign? The Samaritan woman who met Jesus at the well ran into town yelling "Come, see a man, which told me all things that ever I did: is not this the Christ?" (John 4:29). While this woman was actively looking for a sign that the Messiah had come, she was part of an adulterous generation. What sign did Jesus promise? Perhaps William Branham did have the gift of discernment, but he certainly did not have the gift of resurrection. No matter how long they delayed his funeral and memorial service, he did not resurrect. The truth is that Jesus himself pointed only to the coming resurrection as the sign that Messiah had come. What Old Testament Prophecy tells of the Messiah revealing the hearts? Did Jesus have the gift of discernment? So at best, William Branham knew in part. At worst, he made stuff up and passed it off as truth. One example of a significant lack of discernment in William Branham's life is his choice of disciples. In fact, many of the ministers and associates he chose ended up displaying significant lack of morals. While Jesus' disciples gave their life for the Good News (apart from Judas - who only hurt Jesus), people such as Jim Jones, Paulaseer Lowrie, Roger Rudin, Paul Cain, Gene Goad, Leo Mercer and Fred Sothmann spread fear, lies, perversion, and idolatry throughout the world. William Branham claimed that he had the gift of discernment, and that discernment was the "Sign of the Messiah". Some claim this made him a prophet, but others logically conclude that this doctrine makes William Branham the Messiah. In claiming that discernment was the ‘sign of the Messiah’, William Branham taught that he alone possessed this sign for the Gentiles — the first and only person besides Jesus Christ! He became the messiah to the Gentiles in his own mind and the mind of his followers (if he had not come, the world would be cursed, right?). This is why Pastors like Donny Reagan preach that leaving the Message is the unpardonable sin, even if the person that leaves the Message remains a Christian. They deny the power of salvation through Jesus Christ in exchange for salvation through William Branham. William Branham was a false Messiah. Notice. She said, "Well, I perceive that Thou art a Prophet." She said... Now, watch close. She said, "We know that Messiah cometh, and when He comes, these signs will be with Him. But being that You're a Prophet, You must be a Prophet to have these Messiahic signs." Notice. The sign of a seer was the Messiahic sign. She said, "I know when Messiah cometh, He will do these things. But Who are You? You must be a Prophet." Said, "But when Messiah comes, He will do this." ...and He went about and showed these kinds of signs, told Peter who he was and went through, and discerned the thoughts of the mind, and told the woman... And that was the sign of the Messiah. Now, Jesus had come just exactly the way that He--they said--the Bible said He would come. And He did just exactly what the Bible said He would do. And yet, they did not believe Him. He performed the Messiahic sign and showed them that He was the Messiah (in the very same chapter), and they called Him a Beelzebub, a devil, because He was able to discern their thoughts. And they thought that He was a devil. The church thinks today, "Oh, there was a great historical Christ. He--He healed the sick. He could discern the thoughts of their heart. He was a historical Christ. He came to the multitudes. He came to Peter, and He said to Peter, his name was Simon, said, 'Your name is Simon; your father's name was Jonas.' Oh sure, that was Jesus did that. That was the sign of the Messiah according to the Scriptures, what the prophet said." What was the sign of the Messiah? Who knows what the Messiah sign was to be? A prophet (Is that right? ), a discerner of thoughts and foretell. All Jews believe that He was a--the Messiah should be a--a forthteller, He would--He would know what was, and what would be, and what has been; that was the sign. All... God said, "If there be one among you who is spiritual or a prophet, I the Lord will make Myself known to him, speak to him in dreams and in visions. And if what he says comes to pass, then fear that prophet, for I'm with him. But if it doesn't, then don't you hear him; don't fear him at all 'cause I'm not with him." Well, that's just only sense. "And I seen a man stand up on the platform, and by the power of discernment tell people who they were, and out in the meetings, and what was wrong. And just the way the Bible said Jesus done it, to show the sign of the Messiah. Notice. When He came, He made Hisself known to the Jews by being a Messiah, by showing that He was the prophet that Moses rose up, or that Moses spoke of, rather, that He was the Messiah, because He did the sign of the Messiah. And they knew that was Messiah. He perceived their thoughts. That's the Word, sharper than a two-edged sword, a discerner of the thoughts of the heart. Is that right? And He was the Word, and here He is, discerning their thoughts. He cared so much till when a woman, living with six man, identified and knowed and recognized His Messiahic sign of discernment, He cared enough till He forgive every sin and give her waters that she didn't come there to draw, because she recognized. She said, "Sir, I perceive that You are a prophet," when He told her what was wrong with her. And they, she was looking for that day to come, only she had been all church grouped, she didn't have a chance to do it. But when she seen a Man Who could tell her what was wrong with her, she said, "Sir, I perceive that Thou art a Prophet. I know when the Messiah cometh He'll do these things." When, His Messianic sign, now watch, His Messianic sign identified His character, for it was God in a man, the Word. See what I mean? It discerned the thoughts, and told them all these things. And being that I've told you all these nights, and tonight, that He is not dead; He is here, and promised to do the same thing. And promised that there would come a time in the last days, according to Malachi 4 and according to Saint Luke, that He would appear again in human form among His people and do the same things, and reveal the same thing, the same Messianic sign. How many knows that, you Bible readers, knows that's the Truth? Say, "Amen." [Congregation says, "Amen."--Ed.] Must all be Bible readers. ↑ Biblical Studies Press, The NET Bible First Edition; Bible. English. NET Bible. ; The NET Bible (Biblical Studies Press, 2006), Mt 24:24. This page was last edited on 4 September 2015, at 16:23.